The team then developed algorithms to find the most discriminating radiomic features, in this case, textures that can’t be seen by simply eyeballing the images. 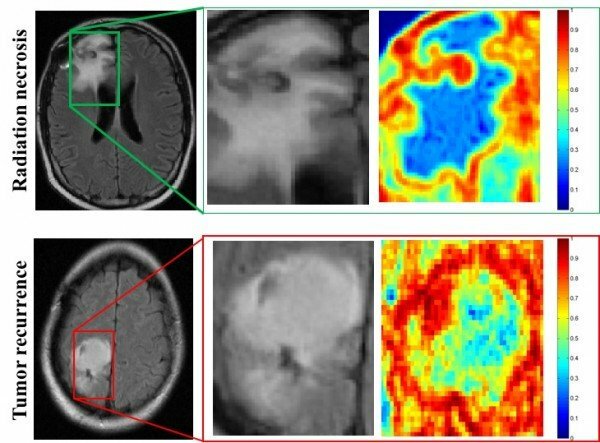 “What the algorithms see that the radiologists don’t are the subtle differences in quantitative measurements of tumor heterogeneity and breakdown in microarchitecture on MRI, which are higher for tumor recurrence,” said Tiwari, who was appointed to the Department of Biomedical Engineering by the Case Western Reserve School of Medicine. Tiwari and Madabhushi don’t expect the computer program would be used alone, but as a decision support to assist neuroradiologists in improving their confidence in identifying a suspicious lesion as radiation necrosis or cancer recurrence. Next, the researchers are seeking to validate and the algorithms’ accuracy using a much larger collection of images from across different sites. The above post is reprinted from materials provided by Case Western Reserve University.